Lastly - Pagpapasalamat or Being thankful to God. It was not only a journey but it is a spiritual journey towards God. The trip was for us to feel the presence of our God in a different level. It focuses with the story of how Jesus saved us from our sin because of the 14 stations of the cross. 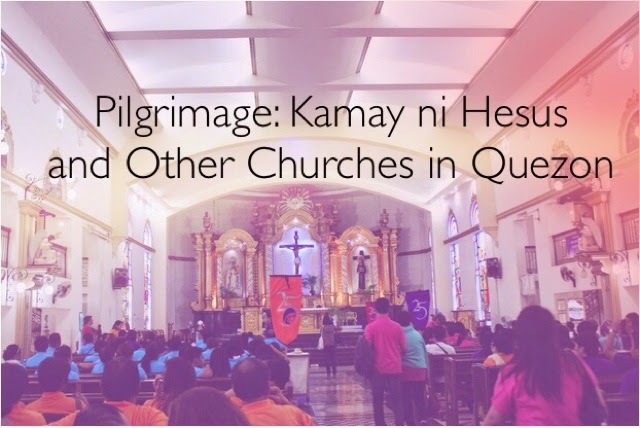 We met a lot of different people in our community who also joined the pilgrimage. It was a fun and exciting spiritual event. Our first stop, Kamay ni Hesus at Quezon. The itinerary set by the organizers where not followed because the 2 buses arrived late that causes almost everything to fail. However, God is with us on our trip even unfortunate events happened, He always made sure we were safe. The 14 station of the cross. We haven't had a chance to the top because of the lack of time. Inside. I have a close encounter with the Holy Spirit on that moment when we were watching the people lining up for the healing session. It was intense. So here's the story goes.. I was with my beau when I entered the church. Most of the time, when it's my first time to visit the church. I pray and make a wish. So that photo above, that was my sight before praying. We don't have the chance to line up for the healing session, I decided to just watch the people to faint every time the priest blessed them. We were at the back watching, I was watching keenly. Then, when the time the next batch fainted. I felt a sudden rush of hot energy towards me. I felt it from my legs up to my head. The feeling was unexplainable. I was tearing up uncontrollably. I felt the Holy Spirit blessed me. It was one for the books. After Kamay ni Hesus, we visited the different churches in Quezon and started the station of the cross. The architecture was so nice. Every corner has a unique detail. The old church was preserved until now it is on a good condition. San Pablo City Cathedral (Laguna) - It is under renovation. Inside San Pablo City Cathedral. This was the last church we have visited. The mass was held here for the end of the pilgrimage.